How many of them are good examples? Based on 2018 data, email marketing is ranked as the most effective marketing channel (beating out social media, SEO, and affiliate marketing). That’s why we’ve gathered 20 jaw-dropping email marketing examples. And why we’ll show you exactly what makes them awesome. 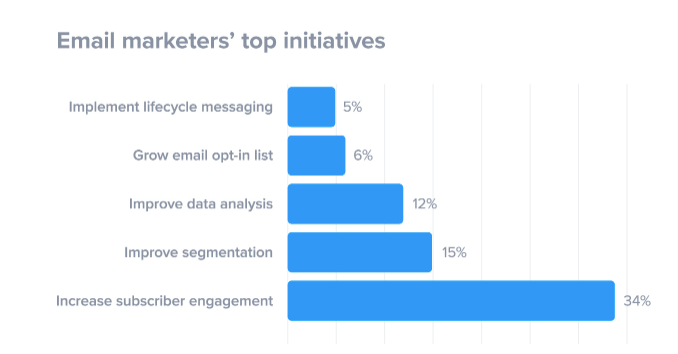 Most businesses use email marketing to increase subscriber engagement (according to a study by Strongview). Good to know. So, we just… do that? To make it easier, here’s how other companies make their emails impossible to ignore. Get our best marketing advice in your inbox each week when you sign-up. Typeform is a Barcelona-based online software company that specializes in online form building and online surveys. This is the re-engagement email they send customers who have stopped using their product. Saying “I don’t want you to leave, please stay” isn’t enough. People need a reason to actually stay (and this email gives them one). People are going to need a little push before they log in again. Voila! 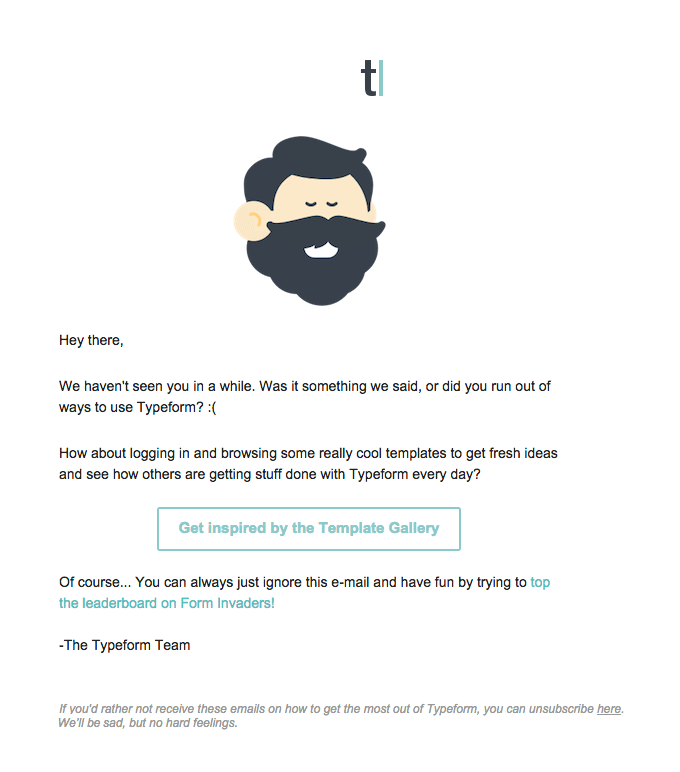 Typeform offers new inspiration from its template gallery. Come on, click it. You know you want to. 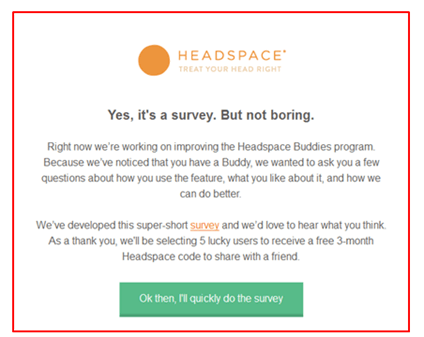 Headspace, an online healthcare company who specializes in meditation, wanted to know more than how their users were feeling about their Buddy feature. So they sent this survey email. This email is upfront about what’s coming (and how long it will take). Yeah, it’s a survey. But not boring. Add to that – a CTA that uses natural, interesting language. The survey is short and not boring, so more people will take it. Rent the Runway, an online service that provides designer dresses and accessory rentals, understands the panic. And not only do they have all the goods, they make sure you know about them when it’s most relevant. In this email, the subject line strikes you first. DON’T buy….isn’t that counter-intuitive for a promotional email? I don’t have to buy ANY of this. RTR saves wedding wallets from certain death. Interesting, conversational copy will get you more sales. According to the First Impressions Email Marketing Study conducted by Ciceron, only 39% of brands send a welcome email. But guess what – welcome emails have the highest open rate of any emails you send to subscribers (with a staggering 60% open rate)!! Luckily 1Password, a password manager, digital vault, form filler and secure digital wallet, is not one of the 61% who doesn’t say hello to new list subscribers. Hey you kids, get off my lawn!! Take your shoes off and stay a while. All of these are commonly used expressions. Why do they work in this welcome email example? Because you’re talking to normal human people, and they like normal human language. A lot of companies give a generic “welcome to [insert company name here]. Be different. Ya know, actually welcoming. Tom Fishburne, creator of Marketoonist, once said “The best marketing doesn’t feel like marketing.” Don’t make customers feel like you’re marketing to them. Everyone loves celebrating achievements. You can celebrate your customer’s milestones, like subscription anniversaries – and you definitely should. But you can also celebrate your own. 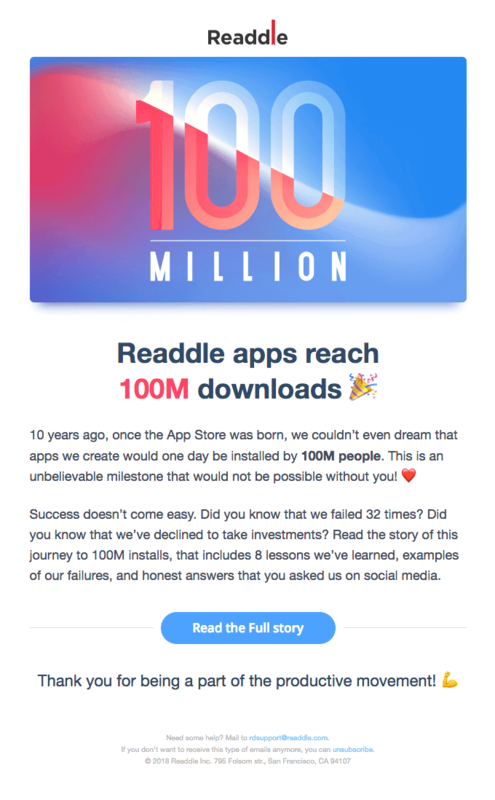 Here’s how Readdle, a mobile application development company, does it. See if you can spot the most important part of this email. 100 million. Dang. That’s a big number. Hard to miss, and definitely not one that you forget easily. Chew(-y) on this great example of a recommended product email. What’s the most powerful word you can use in marketing? (Hint – I just used it, and so does this example). In his book Pre-Suasion, Robert Cialdini explores how the word “you” is captivating. The things that hold your attention are things that matter to you personally. Personalized marketing will never go out of style (or effectiveness). “You” is a really simple place to start. “PAS” (Problem, Agitation, Solution) is one of the most popular copywriting frameworks out there. In PAS, you highlight the reader’s problem by using the same words that they would use to describe it. Problem: What you might not be loving is your sore and aching muscles, if you haven’t exercised in a while. Agitation: I bet you are feeling less than amazing right now. Solution: Did you know that a foam roller helps to decrease muscle stiffness and cramps, removes cellulite, improves flexibility as well as improving blood flow to your muscles? There you have it – problem, agitation and straight to a nice cross-promotional solution. Cross promotion is a marketing tactic where you target the promotion another of a related product or service to your customers. Fitness queen Kayla Istines (who has made a nice chunk of change off of me personally, by the way) uses PAS and a 10% discount to cross-promote a foam roller. No matter what the email occasion is, focus on the audience, not yourself. Yes, but you aren’t trying to keep YOURSELF connected to your own brand. That’s what you are doing with your customers, and this is something that Mack Weldon understands. That’s why the customers get all the presents. But don’t worry! With an email like this one you still do too (spoiler alert – you get the customers). Top it all off with a party-starting CTA, this email is a customer appreciation winner. This Michaels sale promotion email creates urgency in a simple and direct way. “LAST DAY TO SAVE” is pretty cut and dry (and in a big font, pretty unmissable). Clever rhymes are email catnip – as long as the message is still clear. I read this line out loud to myself three times. The line is catchy. More importantly, it targets “loss aversion” (the idea that humans are likely to take action to avoid losing something). This email reminds customers that they only have one last shot before they get stuck with regret. Crafts make your house look nice. Regret makes you bitter. Would you rather get a pretty house or be bitter? Personality in your emails works. You should mostly keep your diary to yourself, but getting really personal once in a while can work – like in this email from Daniel DiPiazza of Rich20Something, an online platform that teaches you how to start an online business. Personal stories make you sound authentic. Your email will sound more like a conversation and less like a textbook. Curated content is a collection of relevant, high-quality content – and it makes for great emails. There’s more to your brand than just saying “use us, we’re really good.” Giving people the reasons why will better the odds that they’ll take you up on the idea. Who doesn’t want these things? When you curate your email content, you can send people exactly what they want to see – without actually needing to create all the content yourself. Newsletter emails might be out of fashion (because they’re technically email blasts and those types of emails tend to scare people), but they can work. This email newsletter from BuzzFeed is a great way to stay in touch with your customers. But only if you do it right. Here’s what BuzzFeed did right in theirs. This copy is “sticky” (and so is the Buzzfeed email). What is sticky copy? Sounds gross (it’s not). Sticky copy: Copy that stops you in your tracks and makes you pay attention. All of these make you stop and pay attention. Because they use powerful words to help you fix your problems. A double opt-in email process is a good idea. But too many people waste the opportunity to send a great confirmation email. Chipotle makes their confirmation email a bit more interesting. 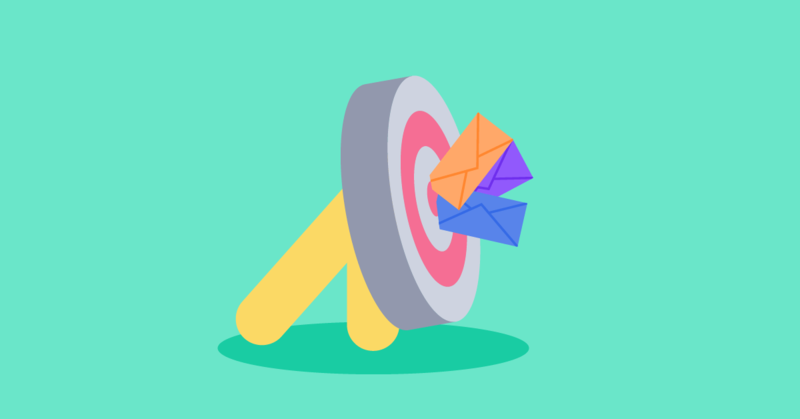 Why use a double-opt email process? 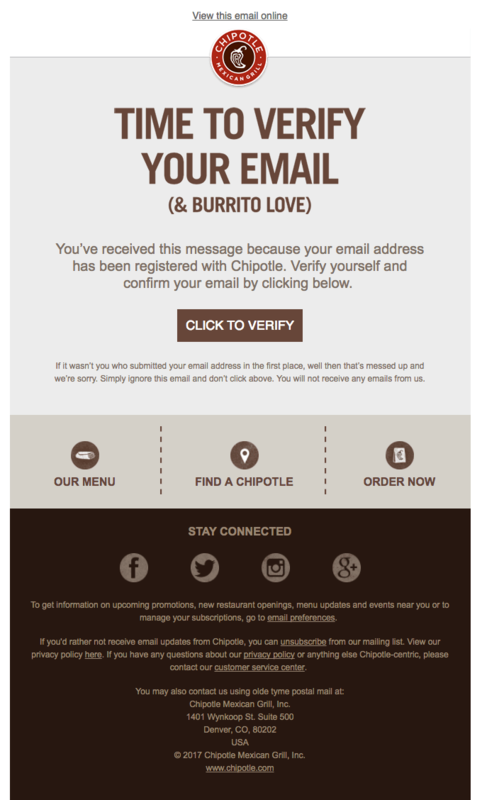 The fun copy and “burrito love” make people more likely to click on this confirmation email. Customers like to be appreciated, but they also like to know why. This thank-you email from Bombas does both. Putting 3 million in the headline copy makes this headline thank-you all the better. Omaze is an online fundraising platform that raffles once-in-a-lifetime experiences and exclusive merchandise for charity. It makes this contest announcement email hard to ignore with a familiar name: Kit Harrington. All Hail the King of the North! Looks like you know SOMETHING, Jon Snow. Don’t mind if I do. Let’s talk about personalization. It’s important, and you need to do it. Jon Snow might famously ‘know nothing,’ but Omaze knows a thing or two about email marketing best practices. I know who Kit Harrington is, but I clicked on this email for another reason – the subject line addressed me personally. But using words like “you” and making copy personal and conversational will always win the day and get the conversion. This email from The Knot is a killer example of a good subject line because it uses an intriguing number. $3,000. Yes, please. Can you enter if you’re not getting married? Asking for a friend. Say that number out loud. Three thousand dollars. If you’re getting married doesn’t $3,000 for a dream wedding sound like the fix you’ve been waiting for? 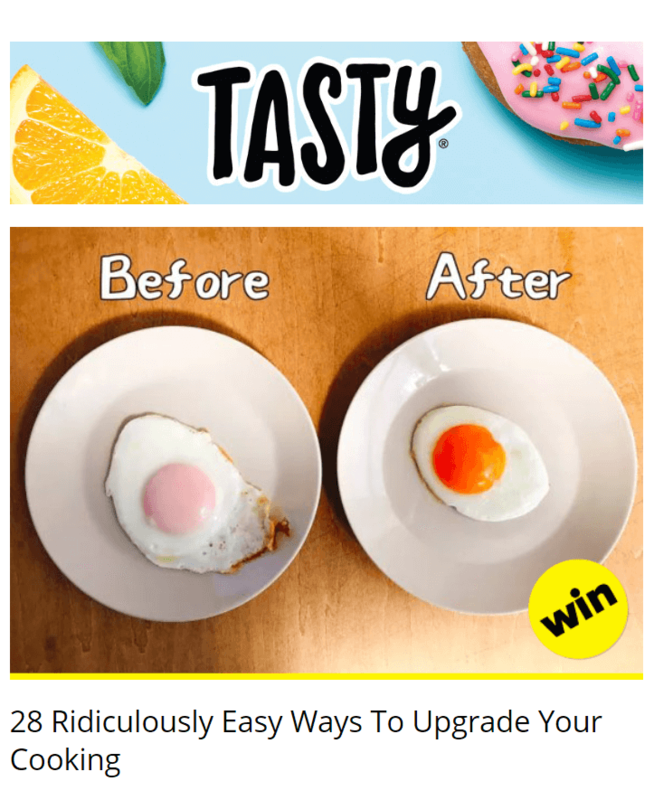 When you combine that kind of attention-grabbing number with some beautiful images and scannable email design, this giveaway email marketing campaign example has everything it needs to get your click. An angular layout can be a visually pleasing format for longer emails with lots of information and imagery, according to Canva graphic designer Mary Stribley. Yeah, it’s a giveaway – there’s a chance you won’t win. But it’s a free $3,000 gift. You’ll at least open the email. Cue the mouse *click* of you opening that email. Next to a welcome email series, an abandoned cart email sequence is the best tool in your digital marketing arsenal. Check out this one from wine club company Winc. I’m not sure who would abandon a cart full of wine, but this email could get them back. 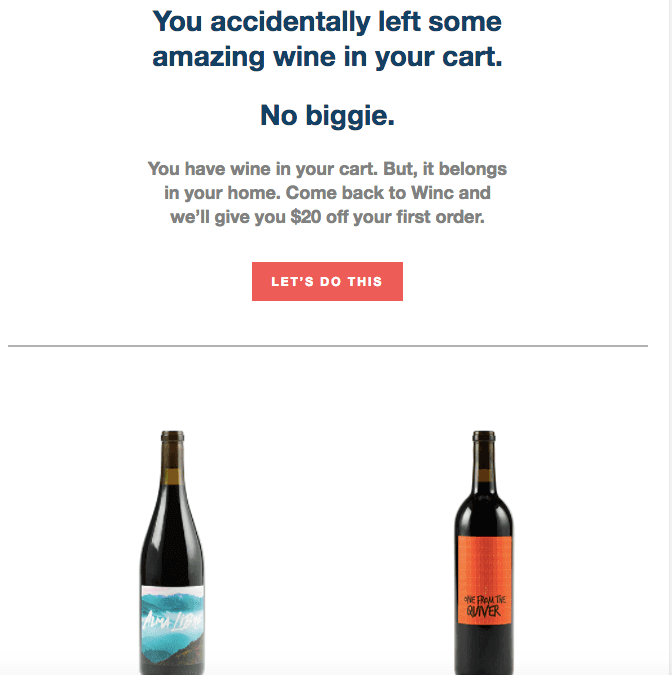 This email from Winc has everything an abandoned cart email needs to get the purchase. Welcome emails are important. This example, from Peloton, shows you how to do them well. Peloton makes it easy for your to say “yes” to your next workout. Casper has great content marketing ideas — and email marketing examples. This email works because it leads with a powerful pain point. Zzzzzz…wake me in another couple hours and ask me then. So comfy. 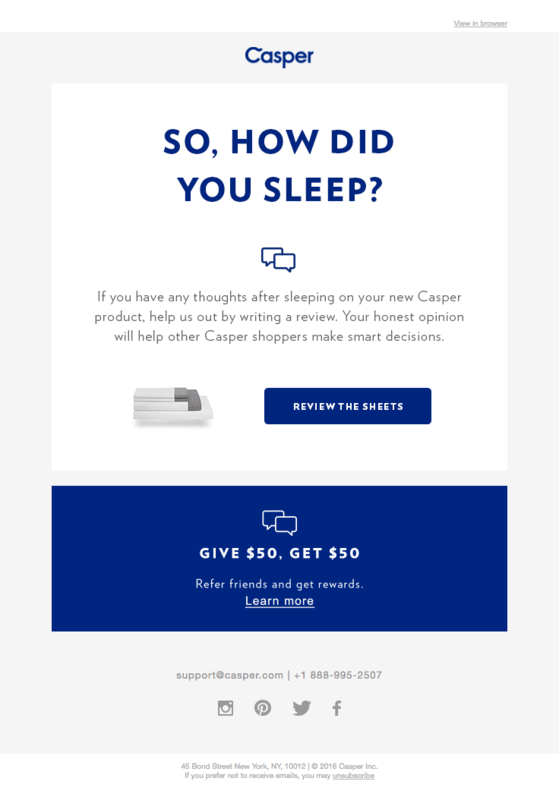 This heading asks “how did you sleep” instead of “how were the sheets.” Casper wants you to leave an online review. And they want you to tell people how well you slept. People buy Casper products because they want to sleep better. Your review will be more persuasive if it talks about that. No one likes to think about unsubscribes – but making great unsubscribe emails great is important. It’s a bummer. 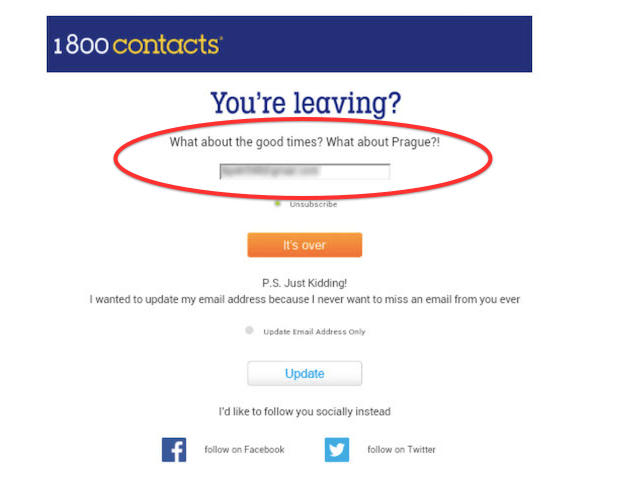 But 1-800 Contacts does a great job of A) sending a perfect unsubscribe email, and B) Leading people to a different type of conversion. Plus, I mean, you guys had Prague. You can’t walk away from that. (Please Note: I’m not even subscribed to 1-800 Contacts. Also haven’t been to Prague. But this email still worked by making me feel nostalgic for everything I’d be missing). There’s a 4th important part of sending marketing emails that work. 91% of customers check their email daily, and 66% of customers make purchases based on an email marketing message. These 5 email design tips will help you get more people to actually read and click on your emails. Make your CTA compelling and put it…where? Colors are more than just “pretty.” They can make or break your conversions. It’s color psychology. In fact, there’s a lot you might not know about color psychology, and how it affects our emotions ( and subsequent decisions or opinions). In a study called Impact of Color in Marketing, researchers found that up to 90% of snap judgments made about products can be based on color alone (depending on the product). Results from another study, The Interactive Effects of Colors, show that the relationship between brands and color is based on whether the color “fit” what is being sold. 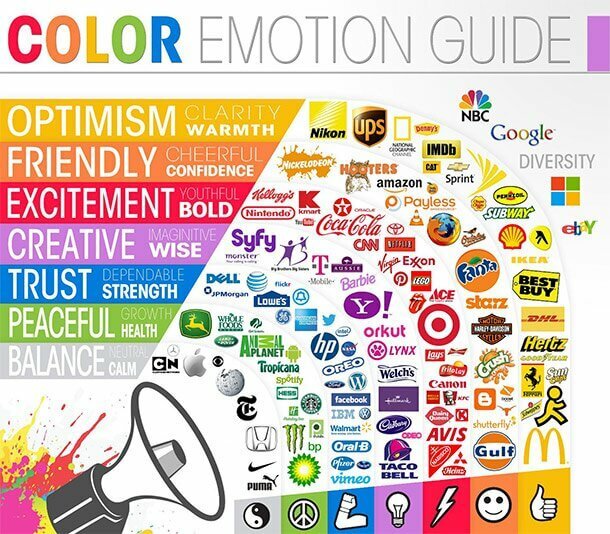 Still not convinced by color psychology? Check out this test from Marketing Donut of how color affects conversions. The red button outperformed green by 21%. Why? Because of contrast. It’s not just the color of a button that makes a difference – it’s every color in the email including the background. Make sure the colors work with the images and text in the entire email. Just remember – colors appeal to emotions differently in some people than others. When choosing colors for your email design, account for brand colors as well as what color says to your customer. Do you remember color-by-numbers, and filling in every white space? Yeah, don’t do that with your email. No one needs to be smacked in the eyes with a rainbow. Copy and images (which you already know you need) are great at making an email exciting and interactive. But eyes will need a break from the party lest they go cross-eyed. A good balance of white space will create a clean, visually pleasing look. A study by Google found that users need less time to judge very ugly or beautiful websites – and they see more complex websites as less beautiful than less complex websites. Use your brand colors, but don’t use a million colors at once. 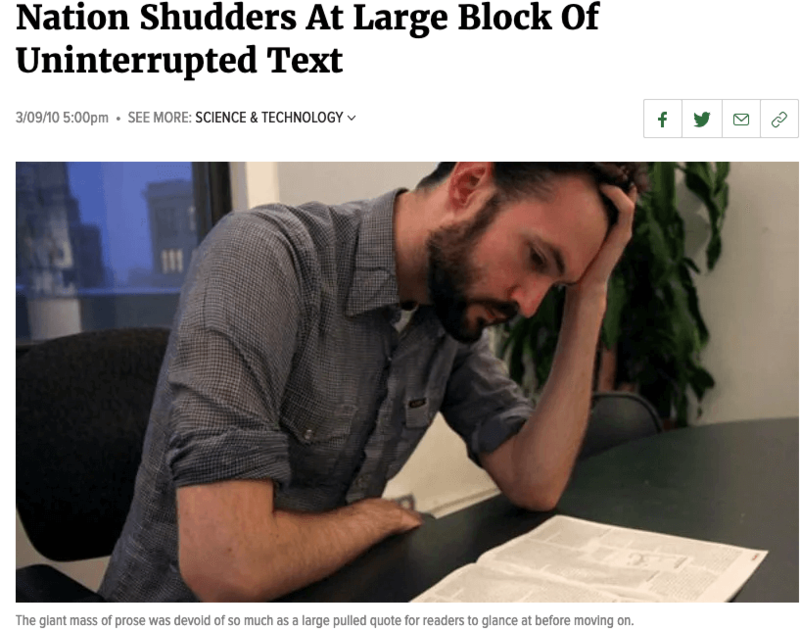 Don’t you hate when someone expects you to read a huge wall of text? TRUTH. Even when it comes from The Onion. Have you noticed that throughout this post, there have been headings, subheadings, images, bullet points, and short lines of text? Too much text overwhelms your eyes just like too many colors does. You need to format your email content for the scanners of the world. 4. 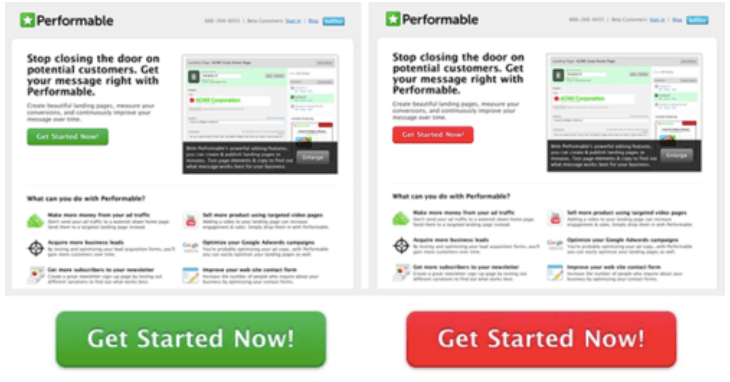 Make your CTA compelling and put it…where? An email CTA is different from a blog post CTA. People will spend less time reading an email which means you only have so much opportunity to get that click. 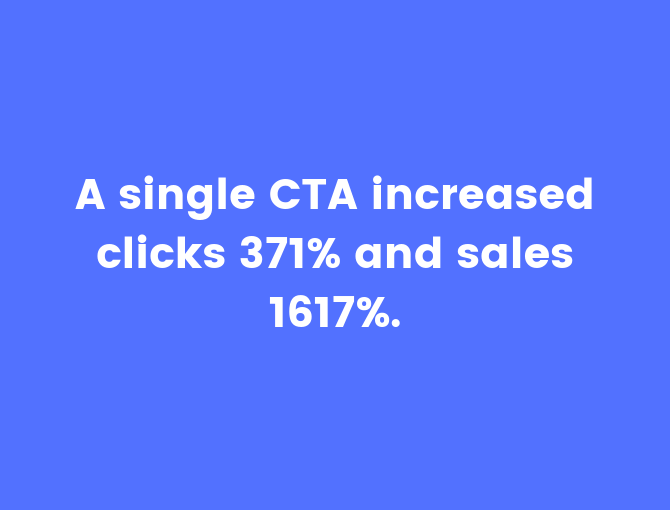 Ellie Mirman, the VP of marketing at Toast, says that emails with a single CTA increased clicks 371% and sales 1617%. Now, where do you put it? It depends on the message. If customers can quickly learn what the email is about, put the CTA at the top. If they need a little context before click, put the CTA at the end. Other option? test both in different emails. There were swirls at the end of most of the words, which felt more staring at cream swirling in coffee. No Papyrus. No script. Nothing that looks like the opening credits of a sappy romantic comedy. Your font should aim to be as clear as your copy. The goal is to get your main message across, not create a Rorschach test. Here are the default HTML email safe fonts that are installed on almost every device.